Bohemond III of Antioch was Prince of Antioch from 1163 to 1201. He was the elder son of Constance of Antioch and her first husband, Raymond of Poitiers. Bohemond ascended to the throne after the Antiochene noblemen dethroned his mother with the assistance of Thoros II, Lord of Armenian Cilicia. 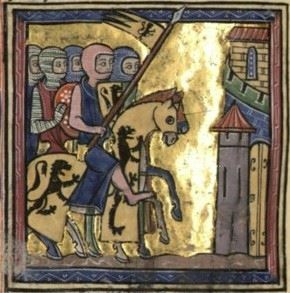 He fell into captivity in the Battle of Artah in 1164, but the victorious Nur ad-Din, atabeg of Aleppo released him to avoid coming into conflict with the Byzantine Empire. Bohemond went to Constantinople to pay homage to Manuel I Komnenos, who persuaded him to install a Greek Orthodox Patriarch in Antioch. He remained a close ally of the Byzantine Empire thereafter. Bohemond forced the Armenian rulers of Cilicia to accept his suzerainty in the late 1180s. He also secured the County of Tripoli for his second son, Bohemond, in 1187. However, Saladin occupied almost the whole Principality of Antioch in the summer of 1188. Bohemond died in April 1201. His son Bohemond of Tripoli hurried to Antioch to attend his funeral.